Who would have thought that healthy vegan scalloped potatoes would become one of our all-time favourite (and most requested) recipes? This healthier version of scalloped potatoes are low in fat, completely dairy-free and get the vegan tick of approval! For this veganized version of scalloped potatoes, I made a classic roux-based sauce that contains garlic, unsweetened non-dairy milk (I used almond), vegetable broth, nutritional yeast and white wine vinegar! There is nothing complicated about the ingredients here, most (if not all) will be in your cupboard already! It is so simple, creamy, and rich. These easy vegan scalloped potatoes are so creamy and gooey. They make for a comforting side dish all year round! Less than 30 minutes of active time. Freezer-friendly. 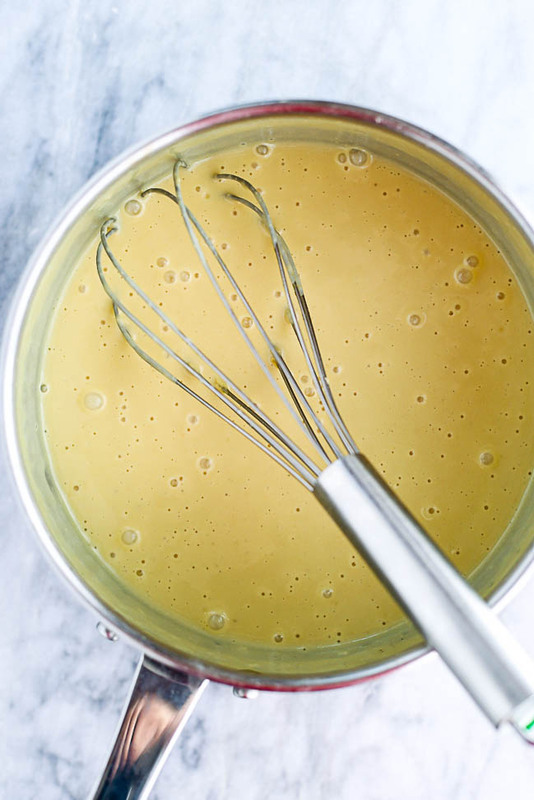 Prepare Cheesy Vegan Cream Sauce. Line a casserole or baking dish with parchment paper. Spread parchment paper with coocnut oil. Place ½ of the sliced potatoes out in an even layer. Season with salt and pepper. Spread the sliced onion over the potatoes. Repeat with remaining potatoes, onion and salt and pepper. Aim for 3 layers at least. Uncover and bake for another 15 minutes. If necessary, briefly place dish casserole under the broiler to toast breadcrumb topping. Let sit for 10 minutes before serving. Recipe freezes well. Recommend freezing in casserole dish used to cook and then transfer to freezer safe bag. If you are interested in washing down your vegan scallop potatoes with a vegan dessert, these vegan cinnamon rolls are the BEST (seriously). PS: If you do make these vegan scalloped potatoes, don’t forget to tag me on Instagram (#dunnebells_). I love seeing your take on my recipes.